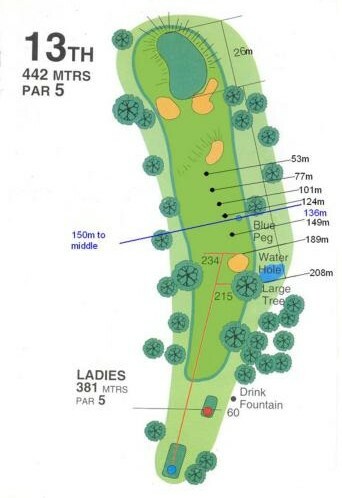 The second of the Par 5’s is a reachable 442 metres, however don’t be fooled by the length as this is the tightest driving Par 5 on the course making an accurate tee shot of utmost importance. The player should be looking to start the ball at the fairway bunker with a slight draw which will roll over the rise in the fairway leaving a mid to long iron into the green. The approach shot to the green is also very difficult with a huge yawning bunker covering the front of the green.